Symbiotic relationships involve an organism that lives on another and thereby derives some advantage, which may or may not be mutual. 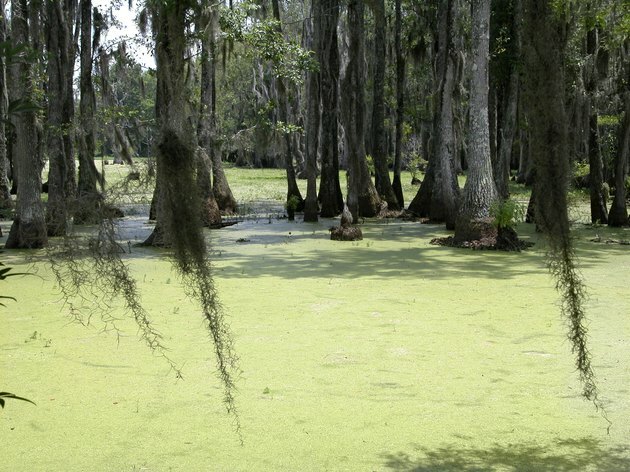 The relationship between Spanish moss and the trees it colonizes is an example of symbiosis. A close-up of spanish moss reaching down from the branches of an oak tree over a bog. A close-up of spanish moss and tree bark on trunks. 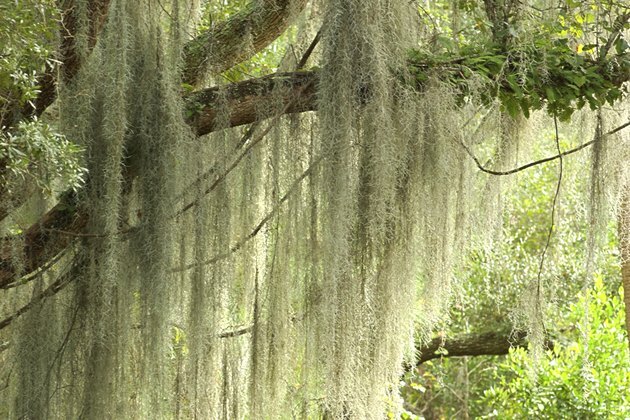 Spanish moss is a type of epiphyte, a plant that lives on another. Epiphytes are distinct from parasitic plants in that they make their own food, so they do not harm the host tree; the host tree neither gains nor loses by their presence. Ecologists call this kind of relationship commensalism. Spanish moss billowing down in a cypress tree forest. 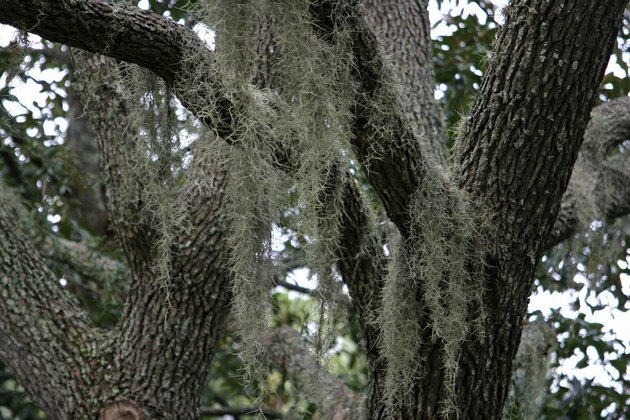 The Spanish moss plant does not have any roots; it wraps itself around the branches of the tree and collects water through special scale-like structures on its leaves. Its favorite hosts are oak and cypress, although it sometimes grows on other trees as well. An abundance of spanish moss covers a tree. 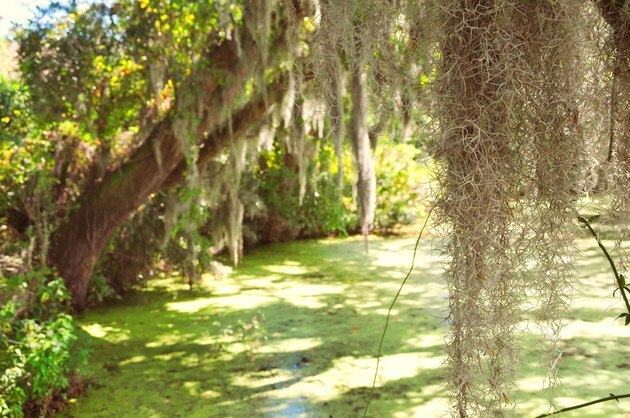 Like other green plants, Spanish moss is a photosynthesizer. 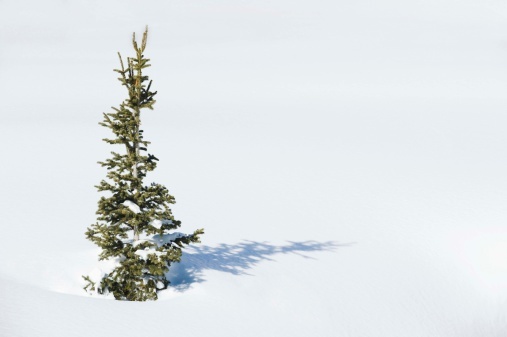 Although it is not a parasite, it can upon occasion harm the host tree, especially if the plant grows to the point where it blocks light from reaching some of the tree's leaves or becomes so heavy the branch breaks beneath its weight. Occasional trimming should be sufficient to avert both of these problems. What Is the Moss Hanging From Trees in the South? What Is the Difference Between Willow Trees & Weeping Willow Trees?